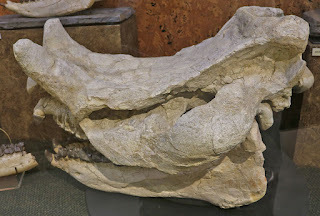 This image is of a Brontops robustus rhino-like skull fossil on display at Mace Brown Museum of Natural History (August 2017). Its name means thunder face (bront ops). It dates to the Early Oligocene Epoch (about 34-32 million years ago) of the Paleogene Period. The fossil was found in Custer County South Dakota USA.